If Nashville, why not A Wedding? If the creative zenith of a master’s signature style, why not its later, steadier application to equally brilliant material? If the ultimate bicentennial satire in the form of a rambling romp through the corrupt, mass market-era country music capital, why not a similar skewering and perversion of the Western world’s most sacred institution? I’ll never fathom the underappreciated status of A Wedding, one of Altman’s darkest, funniest films and the victim of as much critical oversight as Nashville has been of overpraise. Like a Robert Coover bacchanal with reserves of humanity, A Wedding unfolds in standard Altmanvision (dozens of characters overlapping in dozens of intersecting storylines, the camera zooming in and out to capture flying sparks from their improvised set-pieces) to survey the carnage resulting from the hitching of a young oat-sowing Italian, Dino, to his braces-sporting WASP bride, Muffin. Whirlwinds of Altman’s unique kind depend on the fragile ordering of components, the precise arrangement of potentially unruly elements — here a standout performance, there a brilliant spontaneous occurrence, artistically interlocked with strength and integrity. A Wedding, despite a static-setting claustrophobia induced by the Corellis’ statue-haunted mansion and a partial reliance on comic clichés (John Cromwell’s bumbling priest, Lillian Gish’s misrecognized corpse) is chock full of such gems and holds them together surprisingly well, with enough ribald banter, drug use, infidelity, and character collisions to invoke absolute giddiness. (Carol Burnett as the flustered mother of the bride and Pat McCormick’s goofy-in-love, roly-poly Corelli relative are the most endearing pair; the near-silent Mia Farrow and almost everyone else in the cast, the most bizarre.) Amid the chaos, Altman pointedly sends up America’s class, wealth, and religious hang-ups and casts a sarcastic smirk at the late Seventies’ selfish, apolitical pursuit of pleasure, but it’s the film’s moments of miraculous improbability and overall belief in transformation that lend A Wedding an agitated, almost untraceable poignancy closer to the dreamlife of 3 Women than to zany Nashville. As dispersing revelers smoke weed and sing Leonard Cohen’s “Bird on a Wire,” the newlywed couple’s fatal car accident turns out to be their ex-lovers’ death ride, prompting a relieved celebration that only Altman could imagine: father of the groom Vittorio Gassman announces to dead mother-in-law Gish his freedom from the sham life he applied for the sake of her family, the bargain complete with Dino’s marriage. As Vittorio’s Luigi speeds away from the gates, only the statues, and Altman, watch. What proportion of our personalities actually belongs to us? This question constitutes the powerful undertow of Altman’s 3 Women, as well as the beguiling, occasionally frightening pattern of ripples and eddies at the surface of the film. Within that context, the fact that 3 Women is so thematically and stylistically beholden to several other movies, particularly Bergman’s Persona, is either a wry, logical outgrowth of the film’s ideas or a disappointing curb on Altman’s own distinctive sensibility. Certainly, the film plunges ahead with a Jungian, poetically abstract view on Woman that seems entirely at odds with the governing impulse toward demythologization in films like McCabe & Mrs. Miller or The Long Goodbye. And yet, at several moments when 3 Women seems prepared to tip too far into relentless water-and-desert dichotomies or to zoom in one time too many into one of Janice Rule’s fearsome primitivist paintings, Shelley Duvall slams the door of her car on the hem of her dress. Over and over. Shelley drives a lot in this movie, and never without an errant pennant of fabric flapping around in the wind, while she blithely expostulates on boys, men, smart decorating ideas, or pigs in a blanket. This minuscule motif tugs brilliantly at the film, insulating Altman’s more serious, Gestalt conceptions from becoming too serious, and limning an extra dimension of absurd humor in Duvall’s witty and dazzlingly consistent presentation of Millie Lammoreaux. Of course, for those viewers disinclined to abandon the film’s psychoanalytic pathways, this abjected bit of garment fits right into 3 Women’s obsessive interests in repetition compulsions, in unconsciously ritualized behaviors, in puncturing the binaries of interiority and exteriority, and in the unmanageable burdens of femininity and its accoutrements. Among Altman’s many entrancing gifts were his propensity to alter the entire tonality of a film, to beg the question of his own sympathies and sincerities, and to complicate the balance of the portentous and the ridiculous with simple, seemingly throwaway details like this one. Butler the killer (Hugh Millais) prefaces McCabe & Mrs. Miller’s great scene by correcting the rumor mill of Presbyterian Church, Washington. “That man never killed anybody,” he says of John McCabe (Warren Beatty), a lonely hustler full of false self-confidence who builds a whorehouse in a hillside boomtown and is killed when he won’t make a deal. McCabe falls in love with Constance Miller (Julie Christie), a prostitute and his business partner. From time to time he stays with her in her professional capacity; she is sorrowful, an opium addict, refuge on a mountain of sods. When Butler appears and makes his threats, McCabe arms himself. “I never did fit in this goddamn town,” he says. In his room, standing beside his bed, McCabe buckles his gun belt, adjusts his hat, loads his revolver. He puts on his jacket, then his oilskin, pours two drinks and downs them. His face is in shadow or turned away from the camera for most of the scene. Preparing for death, he thinks of Constance, muttering as clear an affirmation of love as anything in film. “Well, I’ll tell you something. I’ve got poetry in me. I do. I’ve got poetry in me, but I ain’t going to put it down on paper. I ain’t no educated man. I got sense enough not to try it.” And then, willing participant in this blueprint of dramatic irony, “I can’t never say nothing to you.” He says it to us instead. McCabe is alone in that scene, and there is nothing on the soundtrack but guitar — no fragments of conversation, no crowds. There are nine cuts in two minutes, from the window to the bed, from McCabe to his box of bullets. Alone, McCabe improves beyond the unlucky charlatan to emerge as the romantic bolstered by resiliency. Resiliency makes him the man he is — makes him the hero and not the dupe — and when he dies in a snowbank, his end seems inevitable rather than tragic. One end is less sad than the other. McCabe wears his big bear coat that way, like the extra blanket on a cold night instead of functional protection for out of doors. Robert Altman’s films were never more open-hearted. His great date movie, you might say, the close rooms and shadows pale beside McCabe’s nervous smiles and the nearness of light in small places. A man dreams of eating marshmallows and wakes up to find his pillow is missing. Kurt Vonnegut has repeatedly stated this is the greatest joke ever told. 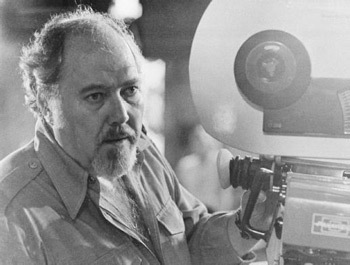 Robert Altman, another dark humorist from the Midwest, never got the chance to film his adaptation of Vonnegut’s Breakfast of Champions, but he did wake up with sand in his bed and inked a movie deal. It was 1976. Altman’s son Matthew had been playing on the beaches of Malibu and fell asleep in dad’s bed with sandy feet. That night Altman had a fever dream about directing a film focusing on three women who exchange identities (two of the women were Shelley Duvall and Sissy Spacek — he even dreamt the cast). The film was set in the desert, and Altman suspected that location was due to all that sand between the sheets. By morning, he’d worked the phones and lined up a deal at 20th Century Fox. 3 Women was his next picture, and it remains his most haunting work. Midway through the film, Duvall and Spacek stop at a roadside saloon (“You’ll like it, it’s air conditioned!”). While the men kick up dust doing donuts on dirt-bikes out back, the two women puff smokes and order beers at the bar. Going for the full guzzle, Spacek salts her beer and slugs back the Mento-volcano of foam that springs forth. (The chugging leads to a deep burp — a burp so exquisite, it’s like the perfect scream the soundman searches for in Blow Out.) Did the sprinkles of sand in Altman’s bed lead to the sprinkling of salt at the bar? Not necessarily. But, like any Altman film, it’s all part of the same piece. Whether it’s George Segal spooning Fruit Loops with call-girls in California Split or Miranda Richardson nursing an eye-dropper of liquid opium in Kansas City, Altman's work is characterized by these serendipitous flashes of brilliance. Like 3 Women, it’s an ocean of memories.